Flowers of the Asteroideae (Asteraceae) are the exclusive pollen source of Stenoheriades asiaticus (Friese, 1921) and probably of the other Stenoheriades species as well. Foto A. Müller. The genus Stenoheriades occurs in the Palaearctic, the Afrotropical and the Oriental region (Michener, 2007; Griswold, 2018). It contains 12 described species, 5 of which occur in the Palaearctic. At least 6 extra-Palaearctic are still undescribed (Michener, 2007). Stenoheriades is a member of the Heriades group and sister to the genus Hofferia (Praz et al., 2008b). According to Griswold (1985), Stenoheriades is divisible into four species groups, which might deserve subgeneric rank. Nesting site and nesting material are unknown. However, several specimens of Stenoheriades maroccana and Stenoheriades eingeddica were observed at dead wood (Benoist, 1928f; C. Praz and C. Sedivy, personal observation), indicating that beetle burrows in dead wood are probably used as nesting site. The slender and elongate body of Stenoheriades is likely an adaptation for nesting in such narrow linear cavities. As all other genera of the Heriades group, whose nesting behaviour is known, use resin for nest construction, resin is probably the nesting material of Stenoheriades as well. Stenoheriades species have a strong affinity to Asteraceae as pollen hosts. The only three pollen loads of Stenoheriades maroccana analyzed so far contained pollen of the subfamily Cichorioideae, whereas the four other Palaearctic Stenoheriades species are probably all strictly specialized on the subfamily Asteroideae (Müller & Trunz, 2014). 1921 Heriades asiaticus Friese, Archiv für Naturgeschichte, 87: 175. Type material: Syntypes mm, “Airan” [Turkey].-Combination Pseudoheriades (Stenoheriades) asiaticus (Friese) in Tkalcu (1984b: 1). Synonymy with Stenoheriades coelostoma (Benoist) in Griswold (1994a: 18), rejected by Müller & Trunz (2014). Identification-Keys, Descriptions: Müller & Trunz (2014: 185). Flower preferences: Probably oligolectic on Asteroideae (Asteraceae); one pollen load also contained pollen of Cichorioideae, suggesting that flowers of this subfamily might be exploited as well (Müller & Trunz, 2014). 1935 Heriades coelostoma Benoist, Bulletin de la Société Entomologique de France, 40: 277. Type material: f(f), “Asie mineure: Taurus” [Turkey], MNHN (Paris).-Combination Pseudoheriades (Stenoheriades) coelostomus (Benoist) in Tkalcu (1984b: 1). 1984 Pseudoheriades (Stenoheriades) hofferi Tkalcu, Annotationes Zoologicae et Botanicae (Bratislava), 158: 2. Type material: Holotype m, “Bulgaria mer.-occ. Peju Javorov (im Struma-Tal)” [Bulgaria], Tkalcu Collection (Praha). Type species of Stenoheriades Tkalcu.-Synonymy in Müller & Trunz (2014). Distribution-Europe: BG, GR, HR. Southwestern Asia: TR. Identification-Keys, Descriptions: Tkalcu (1984b: 5, as Stenoheriades asiatica); Müller & Trunz (2014: 185). Flower preferences: Oligolectic on Asteroideae (Asteraceae) (Müller & Trunz, 2014). 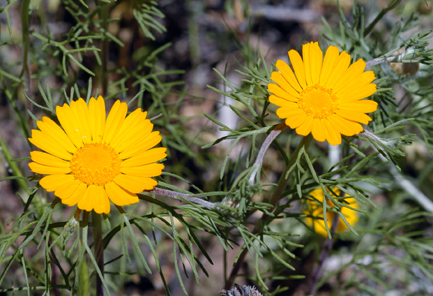 Flower records: Anthemis arvensis (label information). 2014 Stenoheriades levantica Müller, Zootaxa, 3765: 183. Type material: f, “Mt. Carmel, Mitla, 300m” [Israel], ETHZ (Zurich). Distribution–Southwestern Asia: IL, JOR, RL, SYR. 1928 Heriades maroccana Benoist, Bulletin de la Société des Sciences Naturelles du Maroc (Rabat), 8: 212. Type material: Syntypes m(m), f(f), “Aïn Leuh” [Morocco], MNHN (Paris). Distribution-Europe: E, I(Si). Northern Africa:MA. Flower preferences: The only three pollen loads analyzed so far (from three localities) consisted of pollen of Cichorioideae (Asteraceae) (Müller & Trunz, 2014). Flower records: Sonchus, Calendula stellata (label information). 1994 Stenoheriades eingeddicus Griswold, Journal of the Kansas Entomological Society, 67: 18. Type material: Holotype m, “Ejn Geddi Palestine” [Israel], DAAN (Nicosia); paratypes mm, ff. Distribution-Southwestern Asia: IL, JOR, OM, Y. Flower preferences: Probably oligolectic on Asteroideae (Asteraceae). Flower records: Atractylis carduus (Griswold, 1994a), Anvillea garcinii and Pulicaria undulata (both label information).